This post contains spoilers for Halloween. By now, if you kept up at all with the buzz around the new Halloween movie finally coming to theaters this weekend -- or if you want to have any hope of understanding what's actually going on with the franchise -- you probably know that this Halloween is meant as a direct sequel to John Carpenter's 1978 classic, doing away with all the other sequels and reboots and movies in which Busta Rhymes says stuff like, "Let the dangertainment begin!" If you didn't know that, I'm sure you're now much less confused than you were before. 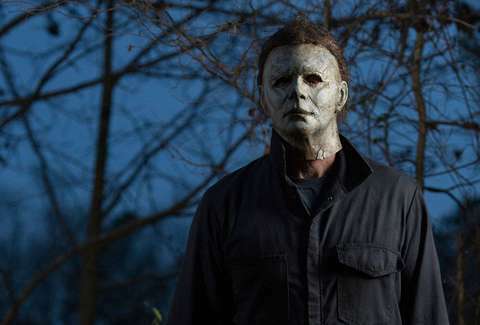 David Gordon Green's Halloween sequel-homage takes place 40 years after Laurie Strode (Jamie Lee Curtis) was first menaced by the embodiment of evil that is The Shape, resurrecting her character (who was casually killed off in Halloween: Resurrection) and essentially retconning every sequel that came between 1978 and now with one simple line. Towards the beginning of the movie, Laurie's granddaughter Allyson (Andi Matichak) dismisses questions about whether Michael Myers is Laurie's brother, saying it was all just a nasty rumor -- and just like that, she does away with decades of baggage that have bogged down the franchise ever since Myers was given any sort of motivation beyond the fact that he is simply animal energy, an unstoppable killing force that will keep coming back no matter what. Because this Halloween wants badly to connect itself to the original movie and nothing else, the callbacks and winks to Carpenter's movie are many -- Laurie refers to Myers' psychiatrist as "the new Loomis," suburban homes and backyards are transformed into gory killing grounds, and, of course, it all goes down on Halloween night. 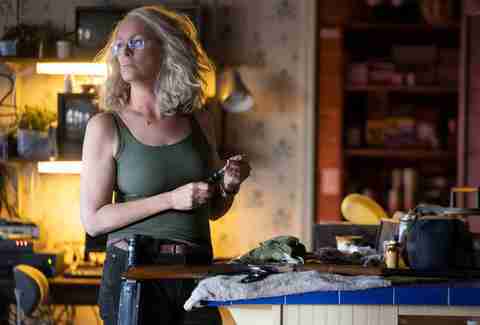 The finale is staged in Laurie Strode's labyrinthine disaster bunker of a house, which she's outfitted through the years with all sorts of weapons, traps, and hiding places. After a tense chase scene through the house, the villain is handily bested by not one, but three final girls, who manage to trick him into a basement booby-trapped with iron bars and gas lines that quickly ignite and burn the house to the ground. The last image we see of Myers is him standing at the foot of the stairs while the house burns around him -- but we don't see him die. The movie can't help itself. Much like Myers, Halloween the franchise is too big, too resilient to die, slowly but inevitably trudging toward us year after year. While this particular sequel ignores the rest of the sequels in its giant series, it cheekily sets the stage for plenty of movies to come after it. Producer Jason Blum has even said he'd love to do a sequel or two if the people want it, and the movie is already set to make more than $70 million this weekend. "It's a movie about trauma," Curtis told the rapt, whooping audience at Halloween's TIFF premiere, "and ultimately, if you've ever lived through any trauma or have a family member who has, it isn't just you and the family member. It is generational." One could say the exact same thing about Halloween, the franchise that keeps coming back to haunt us no matter what.